At Alameda Dental Care we offer a wide range of restorative options when you tooth has a problem. We pride ourselves on offering you options for your care. We believe through education and consultation with your dentist, we can plan the very best comprehensive care plan for your long-term dental health. We encourage you to take some time and review some of the treatment options that are available for you in our office. We are available to answer your questions. Feel free to give us a call anytime. When a permanent tooth is lost, the adjacent and the opposing teeth will drift into the open spaces. This creates an unhealthy situation for your overall dental health. Therefore, replacement of the lost tooth is very important to your overall health. We are able to place and restore most dental implants start to finish right here in our office. Once your dentist has determined you are a good candidate for a dental implant the process can begin. A complete dental implant has three separate pieces. The implant, the abutment and the restoration. The implant is placed into the bone during a minor surgical procedure. You do have the option of being sedated if you are anxious about the procedure. The implant is covered and left to heal and integrate into the bone for 3-6 months. You will return to the office for an evaluation and when the dentist feels the implant is ready to restore, you will move on to the next step. The abutment is the “post” that is placed into the implant. This abutment shows above the gum line and provides a structure your final restoration to be cemented too. A crown is the most common restoration placed on an implant. The dentist will take records and impressions of your abutment. These records will be sent to a dental lab where they will fabricate your new tooth. In about 2 weeks, the lab will return your new restoration to our office where your dentist will adjust and cement it for you. If you have questions about implants and if they are right for you, give our office a call. We will schedule a consultation with one of our highly skilled dentists. Composites, or tooth-colored, fillings are a procedure to repair old failing fillings, decayed, fractured, and/or cracked teeth. We try to conserve as much of your natural tooth structure as we can when we plan for your care. Composite fillings make it possible for us to restore your tooth to a beautiful functional tooth without needing a crown. A composite filling, like any other dental restoration, is durable and long-lasting in the presence of good oral hygiene and regular dental care. However, they do not last forever. When the margins (edges) of the filling begin to breakdown and show signs of leakage and recurrent decay, it is important to have them fixed by your dentist. Composite fillings do not require any lab work so we can place them in one appointment. We do recommend if you need to have several fillings placed in one area, you should do them at the same appointment. This helps achieve the best functional and cosmetic results with minimal visits to the office, fewer injections of anesthetic too. Typically, you should expect your new fillings to be sensitive to cold temperatures for up to six months after they are placed. This is normal and only if the teeth keep you up at night, become sensitive to heat or hurt without being provoked should you become concerned. The cold sensitivity will subside. It is important to note decay is visible to the dentist’s eye, but bacteria are invisible. Therefore, sometimes the bacteria can invade the nerve chamber of the tooth without the dentist or you knowing about it. When the tooth is filled, the nerve can respond unfavorably. This condition is called pulpitis. This is an indication the bacteria contaminated the nerve prior to the filling being placed and you might need to have follow up treatment. 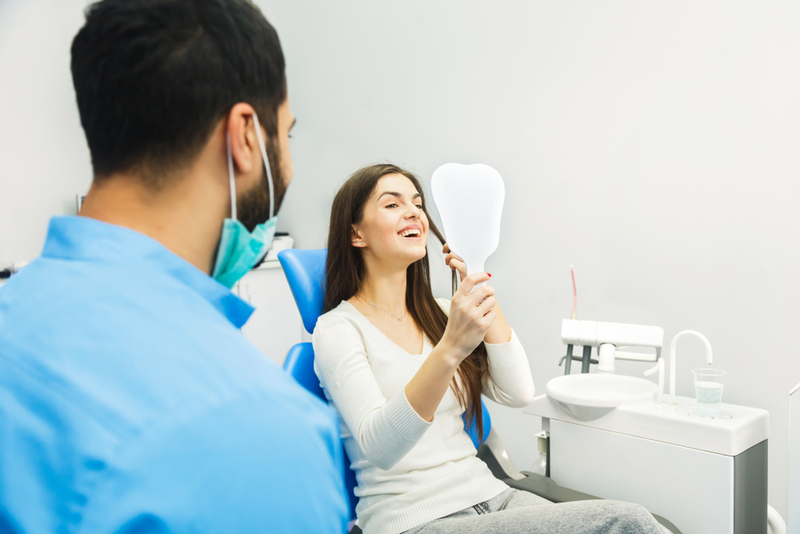 It is best to consult your dentist in Tempe if you have any post treatment symptoms that concern your best dentist in Tempe if you have any post treatment symptoms that concern you. Dental crowns (caps) are a full coverage restoration that is placed on teeth that are too badly damaged to be filled with filling materials. Dental crowns can be fabricated from a number of materials. These materials include all porcelain, porcelain fused to metal or a full gold crown. We are often asked which material is best. The answer depends on your condition and situation. Your dentist will discuss the pros and cons with you. Together, you will be able to confidently move forward with your dental care. You can expect your procedure to take two appointments. The first appointment the dental staff will assist your dentist in removing the failing restorations, decay and/or fractures. The tooth structure that remains often requires reinforcement with a build up to support the new crown. Records and impressions are gathered and sent to the dental laboratory. The new crown returns to our office according to the doctors specifications. You will have a temporary crown to protect your tooth for two-three weeks. Your follow-up (cementation) appointment is when the new crown is tried into place. Your dentist will adjust the bite and contacts as needed and assure the new crown fits well prior to cementation. There is usually an adjustment period as your tongue gets used to the feel and fit of the new crown. At your hygiene visits, please let your hygienist know if you have any questions about your new tooth. Dentures have been a part of dentistry for many years. Although, we do everything we can to help patients’ keep their natural teeth, there are times when a denture is the best long-term option for them. If you are a first time denture wearer, mental preparedness is necessary to the success of your case. New dentures can be difficult to adjust too. They require follow up visits and fine-tuning. There are several types of dentures. Some dentures completely replace all of your teeth where others replace just a few. Full dentures- A full denture is best suited for the patient who has been wearing dentures or those who have been edentulous (toothless) for a while. Full dentures can be made for your upper and lower arches. However, upper dentures are usually easier to adjust too because the roof of your mouth helps to hold them in place. Immediate dentures- Immediate dentures are for those patients who will need to have some teeth removed in order to have a denture placed. These are usually the first set of dentures a patient will have made. Implant supported dentures- Implant supported dentures can be fabricated for a first time denture wearer or a long-time denture patient. Implants are placed into the jaw bone so the denture has something to attach too for support. These can be permanent or removable dentures. The current trend in dentistry leans towards fabricating ONLY implant supported dentures for the lower arch. Partial dentures- Partial dentures are made for upper or lower arches and are designed to replace several missing teeth on one removable appliance. These partials are commonly made of metal and acrylic. Denture/partial denture fabrication takes several appointments with your dentist. Make sure you are armed with patience as you move through the process. Our number one concern is accuracy, not speed. When you are considering dentures as a restorative option, be sure to consult with one of our top dentists about which option is best for you. Fixed bridges are a wonderful way to replace missing teeth. Fixed bridges utilize teeth adjacent to the missing tooth as anchor teeth and a “false” tooth, called a pontic, is fused between the anchor teeth. Fixed bridges are commonly fabricated from porcelain or porcelain with a metal base for strength. Fixed bridges are often the best choice in restoring a missing tooth when the adjacent anchor teeth are heavily restored or in need of dental care. Fixed bridges are also a good choice when you are not a good candidate for a dental implant. You can expect your fixed bridge procedure to take a minimum of two appointments over approximately three weeks. The first appointment allows your dentist to prepare the area for the bridge. Any decaying areas, large failing fillings or fractures in the anchor teeth are removed and restored for strength. Impressions and records are taken at this appointment and temporary restorations are fabricated for you. The impressions and records are sent to the lab, where they create your restoration according to the doctors’ specifications. The second appointment allows your dentist to try-in, adjust and cement the bridge into place. Unlike single implants to replace teeth, your fixed bridge creates some cleaning challenges. The dental assistant will teach you how to care for your new bridge. She will demonstrate how to clean under and around the restoration. Like all restorations, you must take care of the area at home and keep up with your dental hygiene visits. Asking your dentist in Tempe about fixed bridges to replace your missing teeth is encouraged. The thought of needing a root canal can be scary for patients. At Alameda Dental Care, we use the latest technology to assure the best results for your therapy with the least amount of discomfort. Root canals are a great alternative to tooth loss. When a tooth has become infected (abscessed) due to bacteria, decay, trauma or unknown reasons, the tooth does not have to be extracted. In fact, in the long-term, saving your tooth saves you money and discomfort. If your dentist determines a root canal is a treatment option for your tooth, it is good to understand what the procedure involves. Root canals can take several appointments or sometimes can be done in one day. Care is taken to insure you are comfortable during the appointment. The doctor uses equipment to remove the damaged nerve tissue and fills the empty space with a filling material your body accepts. The infection should resolve and your tooth should feel much better after a couple of weeks. If you do not already have one, your tooth must have a crown placed on it following your root canal therapy. When a tree has nourished roots the branches of the tree are pliable and difficult to break. A tooth is the same way. Once the nourishment (the nerve) is removed the tooth becomes brittle and is easy to break. Therefore, a crown is placed to protect and save your tooth. If you still find you are afraid of the procedure and would like to discuss sedation options, we are able to help you. Just communicate openly with your dentist and we will help you achieve your dental needs.